Looking for a reliable yet innovative brand to take care of all your personal hygiene needs? Well, then you’ve come to the right place! The best Kohler bidet toilet seats ensure that you stay at your utmost comfort and stay clean at the same time. This is achieved through a wider variety of different features such as heated seats and heated water tanks. What is a Kohler Bidet Seat? Interested in learning more about Kohler? 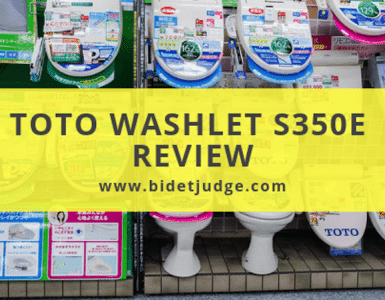 Read ahead for our best Kohler bidet toilet seat reviews! Kohler is one of the leading brands when it comes to bathrooms and toilets. The brand was established in about 1873. Ever since then, Kohler has been striving to improve the standard of living of the common man. The Kohler Bidet Seats are a range of different toilet bidet seats that are equipped with the most innovative features to ensure comfortable personal hygiene. These features can range from touchscreen remote control to self-cleansing wands and can even include deodorizers and dryers. You may also interested in other bidet toilet seat brands such as ToTo and Brondell. When it comes to the best Kohler Bidet Toilet Seats, we have found none that can compete with the Kohler C3 230! Although the price is much higher, it seems justified due to the extensive amount of features. The first and most remarkable feature has to be touchscreen remote that allows you complete control of the spray. It can even save up to two user preferences so you don’t have to enter the settings every time. The control allows you to adjust the water temperature as well as water pressure. The in-line heater is a tankless design which means no more waiting for hot water! The heater directly heats the water coming from the pipe. The heated seat comes with five temperature settings so you can set it up according to your preferences. What’s more is the stainless steel wand with a set-cleansing function through a UV light. This means you won’t have to go through cleansing a wand. Speaking of lights, this amazing unit comes with a nightlight as well! Also included is a de-odorizer for optimum odor control. The seat and the lid are both Quiet-close which means you can just drop them and they will close slowly on their own. For optimum cleaning and comfort, the oscillating and pulsating spray ensures that you get yourself cleaned properly. All in all, the C3 230 is a high-end product from Kohler with extensive features all built to ensure the most comforting and refreshing experience. Allows you to control and adjust the pressure and temperature of the spray. Includes a ton of features such as Quiet Close Lid and Deodorizer. Tankless endless supply of hot water. Cleaning jet could be stronger. The screen holder is a little loose. The Kohler K5724 Puretide Bidet Toilet Seat is an all in one solution for all your cleaning needs. The bidet is a manual one which means it is eco-friendly as it does not use electricity to operate. (See also other non-electric bidets). All you have to do is operate it with a manual lever situated at the side of the seat. Also included is a self-rinsing wand which makes it easier to keep the toilet clean. The wand can be adjusted to spray in different positions from anterior to posterior wash. You can even control the flow and volume of water. Apart from that, the Quiet close technology ensures that you can quietly close the lid without ever touching the seat. The Quick release hinges present at the back of the seat makes it easier to detach the seat for cleaning purposes. The manual Kohler bidet seat is as easy to attach as it is easy to release. This means you don’t even need a plumber to install the unit. Instead, you can install it all on your own. Once you have installed it, the Grip-Tight bumpers hold it in place so that you can go about your business without the fear of the seat shifting. Overall, the Kohler K5724-0 Puretide has an ergonomic design that ensures better comfort. The low and sleek modern design allows for a more comfortable seat. The elongated seat, on the other hand, allows folks of any size to be seated comfortably. Eco-friendly as it doesn’t use electricity. Easy to use and install. Multiple positions and flow settings. Cleaning the seat and wand is hassle-free. The seat tends to shift a lot. The spray is not accurate always. 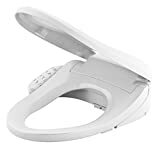 Next, in our Kohler bidet toilet seat reviews are the Kohler C3 125 Bidet Toilet Seat! The bidet seat uses two separate nozzles to allow you to cleanse yourself with the touch of a button. The two nozzles have a feminine and posterior wash as well. The Kohler C3 125 features a tank heater which allows you to get a limited supply of warm water to effectively cleanse yourself. Also included is a heated seat that allows you to adjust temperature settings according to your own preferences. To help you make your way in the night, an LED lighting illuminates the toilet bowl and acts as a nightlight. This is especially great for children who would find it harder to use the toilet in the dark. The Kohler also features a deodorizer helps to minimize odors and keeps the air fresh in the bathroom. The C3-125 features a sidearm control panel that provides you an easy access to different settings. The panel features about 3 different temperature settings as well as three different water pressure settings. Even the heated seat comes with about three different temperature settings. You can even use the panel to adjust between pulsating spray cycles and provide a massaging stream of water for a kind of spa-experience. Worried about closing the lid too hard and damaging the electronics? Well, the seat is equipped with a Quiet-close lid that slowly closes the lid without slamming. To top it off all, the toilet is the best Kohler bidet toilet seats because it is constructed out of anti-microbial plastic! Multiple heats and pressure settings. LED lighting that acts as a night-light. A massaging stream of water for cleansing. Easy to access side arm panel. Provides a feminine and posterior wash.
You have to wait for the heated water. 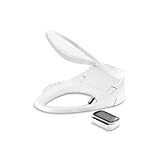 One of the best Kohler Bidet toilet seats, the Kohler K-4737-0 Bidet Toilet Seat is jam-packed with amazing features to ensure comfort and cleanliness. The toilet is equipped with a tank heater that ensures you get a large supply of warm water whenever you need it. The Kohler features a front wash as well as a rear wash mode so males and females can equally benefit from the bidet. This is because the toilet is equipped with two separate nozzles for a hygienic gentle wash. Also included on the side of the toilet is a control panel with all the controls you need to make it as comfortable for you as possible. The panel allows you to choose from any of the three different temperature settings as well as three different water pressure settings. It even allows you a choice from three different heated seat temperatures for maximum comfort. The pulsating cycle ensures you get a massaging stream of water as well. Also included is a warm air dryer that allows you to dry yourself without wasting toilet paper. On the other hand, the deodorizer ensures you can get rid of any unwanted odors. Other features based on comfort include a quiet closing lid as well as a quick release function for easier cleaning. An integrated blue LED light makes it easier for users to detect the toilet in the dark. What’s more is the unique energy saving mode that powers the seat down after hours of no use. Includes various temperature and pressure settings. Quiet closing lid and deodorizer are included. Provides a massaging wash for anterior and posterior modes. Heated Water is not continuous. The Kohler C3 200 is one of the best Kohler bidet toilet seats in terms of personal hygiene and comfort. The best part of the bidet toilet seat is that it uses a tankless water heater design whereby it heats the water as it comes into the line. This means you won’t have to wait around for hot water. Another key feature of the C3 200 is perhaps the remote control. This means you won’t have to reach to the side. Instead, you can either mount it on the wall or keep it on your person. The control allows you to change through different water pressure as well as different water temperature settings. In fact, you can even change the temperature settings of the heated seat. The remote also allows you to change between the front wash and the rear wash. You might think so many control options will make it hard to operate. On the contrary, the remote saves up to two user preferences so you can use the bidet quickly without fumbling with the settings. Also included is a nightlight function as well as a deodorizer and a dryer. However, that’s not all! The wand allows you to choose from 5 different positions which means you can get maximum cleansing. The oscillating feature allows you to cover a wider area of cleaning. The unit is quite easy to install as well. All you need is a water supply and an electric supply, and you’re good to go! Easy to install and use. Multiple variable setting for pressure, temperature and even position. A continuous supply of hot water. The seat is much smaller for larger individuals. Seat tends to shift a bit. The Kohler C3 155 is an elongated warm water bidet toilet seat with many features for a refreshing experience. What’s unique about the C3 155 is perhaps the hybrid heater design that allows for you to get continuous hot water. This is a huge upgrade from tank heaters that are bulky and take some time before providing you with hot water. The slim and low design of the toilet ensures that even the heaviest of individuals can use them. It further makes it easy for kids as well. The heated seat is an in-demand feature in colder countries where folks don’t want to freeze themselves while doing their business. The heated seat comes with five different temperature settings to ensure personal comfort. The stainless steel wand is equipped with a UV light which means the wand can cleanse itself. The side arm panel consists of all the controls such as temperature and water pressure. They also include the heated seat temperature controls. The air dryer is warm and allows you to dry yourself off without the need for abrasive paper. The airspeed and temperature of the dryer are adjustable as well. The automatic deodorizer ensures your toilet always smells fresh. The built-in UV light acts as a night light, making it easier to locate the toilet in the dark. All in all, the Kohler C3 155 is the perfect medium between the cheaper brands and the more expensive ones. Allows you to control a number of different parameters. Has a nightlight, deodorizer and a warm air dryer. Comfortable and ergonomic to use. The water pressure may be a little too strong for some users. So, to sum it up, Kohler is a reliable and consistent brand that has catered to millions of people and provided them with the best comfort. Their bidet toilet seats are no less! These best Kohler bidet toilet seats ensure that your toilet experience is one where you experience extreme hygiene and personal comfort. Even though they may have some cons, their pros certainly outweigh them. The best part about these seats is that they are available in many different price ranges so you can buy according to your budget. Don’t believe us? Try out the Kohler seats now and check for yourself! Image by Galen Smith and we made some transform. Last update on 2019-04-20 / Affiliate links / Images from Amazon Product Advertising API. Nothing on this site should be construed as medical advice. 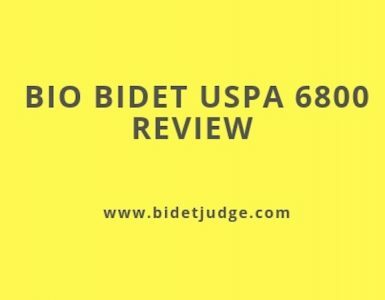 This website is for informational purposes only.bidetjudge.com is a participant in the Amazon Services LLC Associates Program, an affiliate advertising program designed to provide a means for us to earn fees by linking to Amazon.com, Amazon.ca, Amazon.co.uk and affiliated sites. Amazon and the Amazon logo are trademarks of Amazon.com, Inc, or its affiliates. Nothing on this site should be construed as medical advice. This website is for informational purposes only. 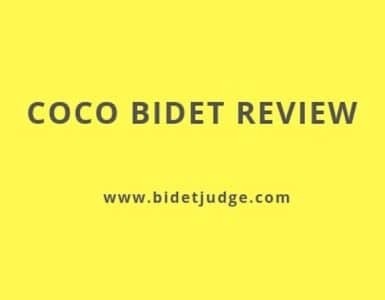 Bidetjudge.com is a participant in the Amazon Services LLC Associates Program, an affiliate advertising program designed to provide a means for us to earn fees by linking to Amazon.com, Amazon.ca, Amazon.co.uk and affiliated sites. Amazon and the Amazon logo are trademarks of Amazon.com, Inc, or its affiliates.